This book is part of the ongoing debate about Paul's understanding of the relationship between his own mission and the church's. While this study endorses some previous scholarship on Paul's silence about the church's proactive evangelism in his letters, it argues that explanations for such silence cannot be adequately made from exegetical conclusions on related texts alone. Rather, this study suggests that constructing a plausible conception of mission as understood by Paul, influenced by the impact of the Jesus-tradition and Jewish restoration eschatology, is essential for explaining Paul's thinking. Dr Kang proposes that Paul's silence regarding congregational evangelism is due to his unique two-pronged conception of mission - one being the event of eschatological heralds, the other being the event of eschatological community. 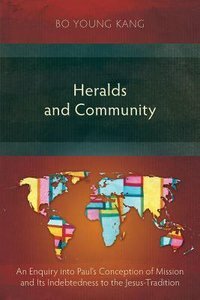 About "Heralds and Community: An Enquiry Into Paul's Conception of Mission and Its Indebtedness the Jesus-Tradition"
Appendix A Paul's Conception Of Universal Evangelism?